Headlong’s highly acclaimed adaptation of George Orwell’s famously chilling novel 1984 returns to London for a limited season, revived by Olivier Award-winning director Robert Icke and Olivier Award-nominee Duncan Macmillan. Originally premiering at the Nottingham Playhouse in 2013, 1984 has enjoyed international tours and returns once more to the West End for 12 weeks beginning in June, at the Playhouse Theatre London. 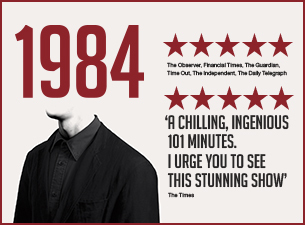 1984 is the smash-hit exploration of a dangerous and damning society, which remains frighteningly relevant today. Published in 1949, Orwell’s darkly dystopian novel continues to be highly pertinent and is often described as the definitive text of the 20th century, examining the detrimental effects of surveillance, identity and control. 1984 follows a group of historians as they discover Winston Smith’s diary and must determine whether it is fictional or a sinister snapshot of reality. Ministry of Truth employee, Winston, lives in a controlling world, where an invasive government and Big Brother keep a close and watchful eye on their citizens. When Winston suddenly falls in love, he finds himself beginning to think independently and soon must face the consequences.